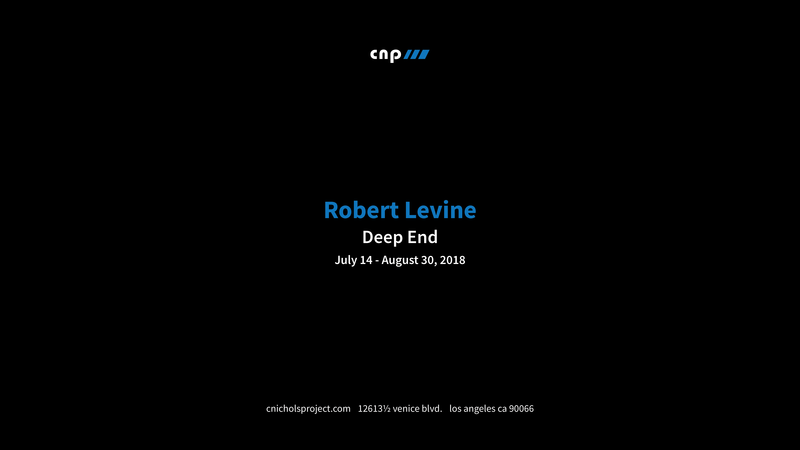 Humor in language and the history of art is extended through the 16 oil-on-linen paintings in “Deep End” by Los Angeles artist Robert Levine. The cliché of painters painting pools in Los Angeles is rooted in contemporary plein-air and landscape painting. Think the sun-bleached pool-scapes of Ed Ruscha and David Hockney. Levine’s pools are detached from the earthly landscape, literally floating through the environs of space. The new paintings are carried forward from a series of paper collages from 2015, depicting sets of swimming pools on the moon. In “Deep End” the small oil paintings of large swimming pools are at the same time liberated from the lunar surface while still attached to their suburban backyards. Robert Levine (born 1962, Pittsburgh, PA) lives and works in Los Angeles. He received his bachelor of fine arts from Carnegie-Mellon University in Pittsburgh, Pennsylvania and his masters of fine arts at California Institute of the Arts in Valencia, CA.